I am very excited and honoured to be asked to judge the Hands On Cookoff this year! Michael and I have been involved with this for the past few years, but we haven’t always been especially successful in creating our own entries. Oops. The Hands on Cookoff is a contest sponsored by Better Together, which is an online community forum that is trying to encourage us to spend more time together in the kitchen. This is, as you can well imagine, a concept I can get behind! Food and love go together for me. Food is a huge part of my social life. There are few things I love more than catching up with friends over a great meal–and it’s always fun to cook with people. The Hands-on Cook-off contest is a way to raise awareness of the significant benefits of cooking and eating together, and inspire families to reap the associated benefits. Cooking and eating together is linked to many benefits for children, youth and families. These include better grades in school, better health, and overall social adaptability. Food is bonding experience in our lives, and I think it’s really important that we teach our kids how to cook. It’s good for them to learn these kinds of skills–independence and life skills that will set them up for a much healthier lifestyle. Here’s how to enter: get together with a friend or relative and create a home video cooking show three minutes long or less. Videos must include two or more generations or two youth preparing a recipe together, but you don’t have to be related to each other. The best video (judged by yours truly and TV personality and cook, Art Napoleon; Michelle Tang, Co-founder of Foodie Kids Inc.; Chef Paul Cecconi of Brodo Kitchen;and award-winning cooking instructor, Chef Heidi Fink) will win $1000! The contest is open to anyone in BC. Get your entries in by noon on May 18. This year’s contest theme is celebrating and redefining “family”. Here in BC, family means something different to all of us and we’d like to see what it means to people around the province! 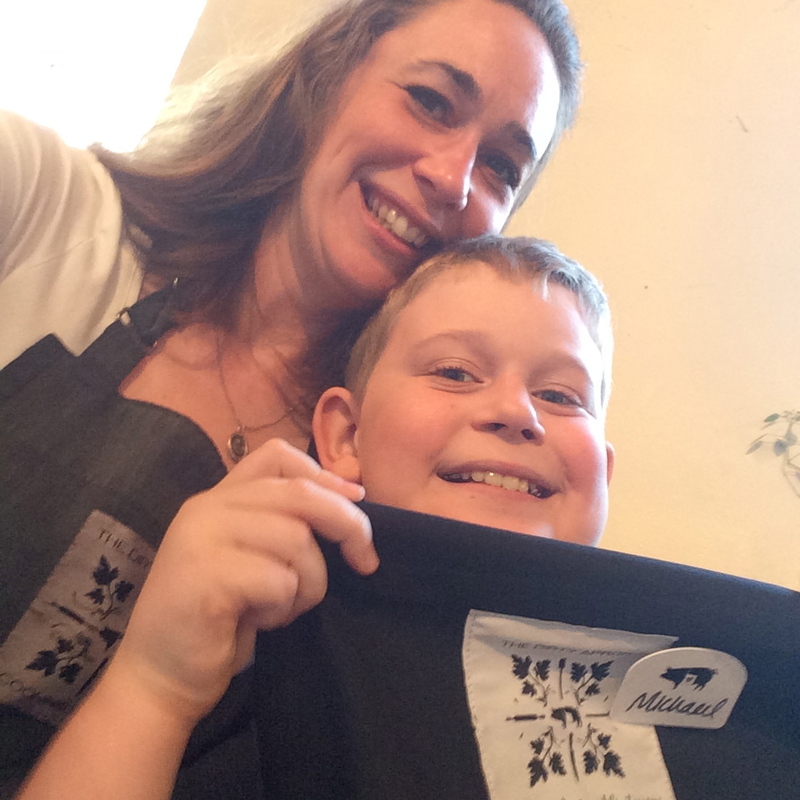 Cooking together is a grounding and deeply bonding tradition for individuals, families, and for communities. New this year – an Instagram component! People can enter through Instagram with a short video for a chance to win a $250 Amazon.ca gift card! 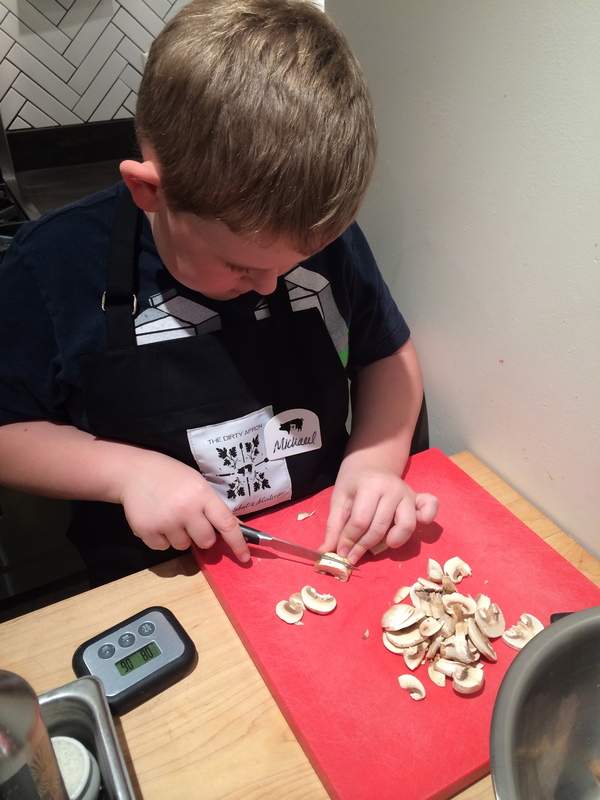 They must simply follow and tag @bettertogetherbc and include the hashtag #handsoncookoff. Videos must be one minute or less and feature two generations cooking together. One winner will be chosen by random draw. Allright, guys. I’m sure you, like me, have dishes that terrify you. You think, “I can’t make that! It’s too hard/complicated/technical.” Soufflé is one of those dishes that has long been on my list. Until last week. Soufflé: it’s intimidating, right? When you go to a fancy restaurant, you have to order it the day before. If you don’t whip the eggs right, if you don’t bake it right, it falls. Then you have pancakes instead of a light, fluffy, soufflé. Soufflé fail. 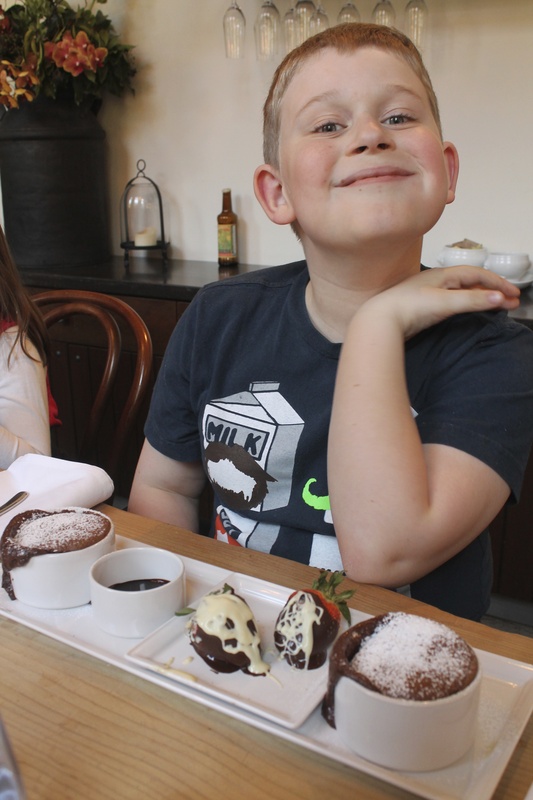 But last week, I got to attend a mother-son cooking class at The Dirty Apron, and Michael and I made a chocolate soufflé that was the bomb! And didn’t bomb! I was so excited to be invited to take this class. I’ve been wanting to try out cooking classes at The Dirty Apron for so long, and I’ve been equally as eager for M and I to spend more time in the kitchen together. This was the perfect opportunity. The set-up was fantastic. Loads of space, we each had our own gas range, and professional-grade knives, pots and pans and implements. Chef Takashi Mizukami, who’s a dad as well, patiently demonstrated proper knife skills, and then how to make a chicken pot pie, and finally, the chocolate soufflé. 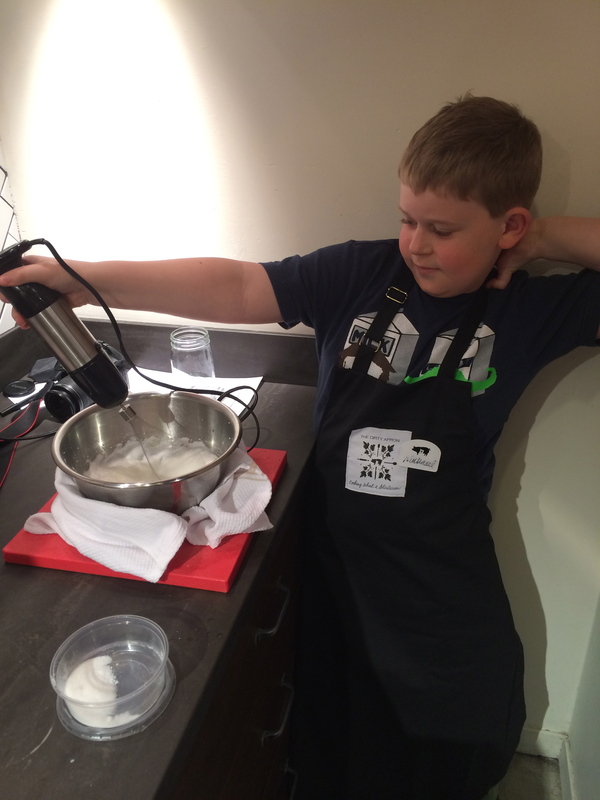 We attended the class with a bunch of other parent bloggers and their kids, as part of the kick-off for a new contest, called the Hands On Cook Off contest. The contest is sponsored by Better Together, who is encouraging families to cook and eat together a family meal several times a week. Research has shown that families that cook and eat together are healthier, both mentally, physically, and emotionally. I think it’s important to note here that the 10-yr-old’s favourite part was using the stick blender with the whip attachment to make the meringue. Boys never really outgrow their love for power tools, do they? Prep the ramekins by buttering them, and then coating them with a layer of sugar. Keep in the fridge until you are ready to fill them. Over a double-boiler, melt the butter, and then add the chocolate. Stir gently, and allow to melt. Once it’s melted, mix it all together until it’s smooth and glossy, and then set aside to cool a little. Carefully separate the eggs, and begin beating the whites in a large bowl with a whisk, or ideally, with electric beaters. Beat them until they reach a soft peak, and then slowly add the sugar, and continue to beat until they are stiff and glossy and form solid peaks. You should be able to to turn the bowl upside-down when they are ready. Beat the egg yolks in a separate bowl, and then slowly and carefully add them to the chocolate mixture. Add the cocoa powder and mix well. Now, carefully fold the chocolate/yolk mixture into your egg whites, using an over/under motion with a spatula. When everything is all mixed, pour the batter into your prepared ramekins, filling them about 2/3 to 3/4 of the way up. Place on a baking sheet, and then bake in a preheated 400 degree oven for about 12 minutes. Remove from oven, dust with icing sugar, and eat while still warm. Now that we’ve conquered soufflé, what shall we make for the cooking contest? Special thanks to The Dirty Apron and Better Together. Read more about the contest here.